"That arrangement there in Palestine keeps us awake," SA's Foreign Minister Maite Nkaona-Mashabane says. South Africa has slammed Israel's plans to build new homes in Jerusalem as pro-Palestinian activists launched an international campaign for the release of terrorist prisoners, whom it calls "political prisoners." "That arrangement there in Palestine keeps us awake," South Africa's Foreign Minister Maite Nkaona-Mashabane on Friday told members of Cosatu, the largest trade union, which is a political ally of the ruling ANC party. "The last time I looked at the map of Palestine, I could not go to sleep. Its dots, smaller that those of the homelands," she said referring to the former homelands in South Africa, which were also known as bantustans, created under apartheid to give blacks a sense of autonomy. South Africa was chosen by pro-Palestinian activists for the launch of an international lobby seeking the release of what they say are 5,000 Palestinian "political prisoners" currently in Israeli detention, including Fatah's Marwan Barghouti. The "political" prisoners being referred to are all terror suspects. Barghouti was tried and convicted on charges of murder, and sentenced to five life sentences. 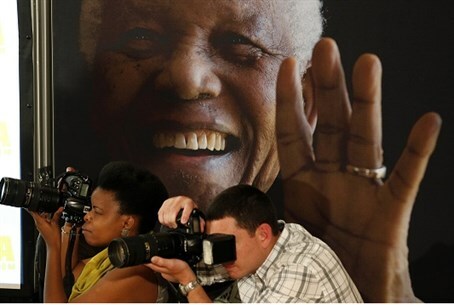 The campaign was kicked off on October 25 at Robben Island, the former prison where anti-apartheid hero Nelson Mandela served 18 of his 27 years in jail. "The Palestinian quest for self determination remains unfulfilled," said South Africa's top diplomat. Since the fall of the whites-only apartheid regime in 1994, South Africa has been an outspoken critic of Israel, although it maintains diplomatic ties with the Jewish state.